Glenn Renwick visited campus in April of 2016. The very first guest lecturer under the Linda Parker Hudson Engineering Leader in Residence program, Glenn met with the directors and staff of the Engineering Innovation and Engineering Leadership institutes and discussed ways to expand curriculum and programming for both, with a focus on preparing students for the workforce. He met with rising stars among the college’s faculty for a conversation on leadership and overcoming challenges. His public lecture on Fostering Diversity & Inclusion was widely attended by campus leaders, faculty, staff and students. Renwick has led Progressive since January of 2000. In this role, he is responsible for product and claims development and delivery, customer service and sales efforts of both the agency and direct distributions and the technology to support all Progressive’s operations. 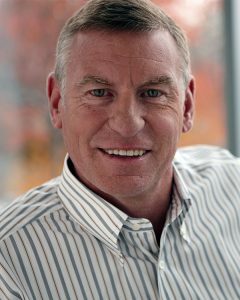 Prior to assuming the CEO role, Renwick served as business technology leader from 1998 through 2000 and earlier led the company’s consumer marketing efforts in developing and communicating Progressive’s consumer proposition and brand. Renwick joined the company in 1986 as auto product manager for Florida. In 1988, he became president of several mid-Atlantic states, headquartered in Richmond, and later roles as president of the California division in Sacramento, and Northeast division based in Cleveland. Renwick has an undergraduate degree in mathematics and economics from the University of Canterbury in Christchurch, New Zealand. He has a master’s degree in industrial and systems engineering from the University of Florida.